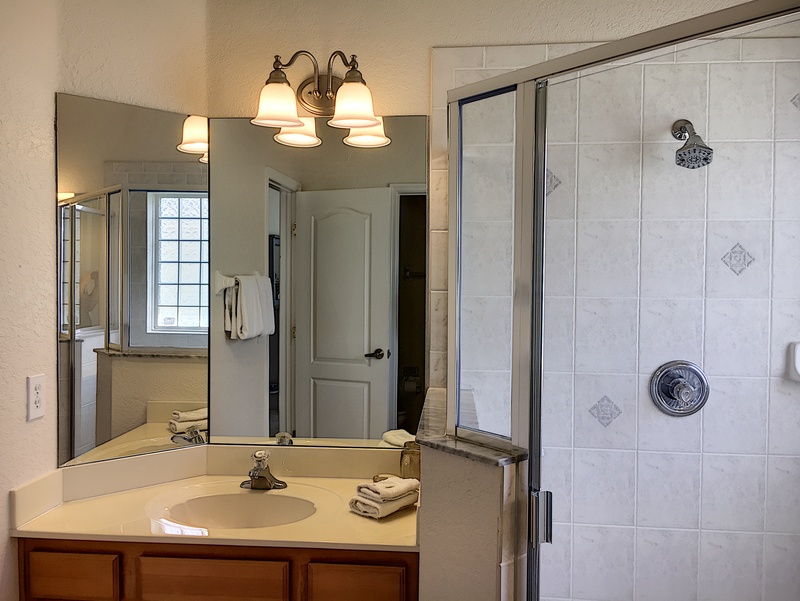 Charleston Manor is a beautiful four bedroom, three bathroom vacation home located in The Manor at West Haven. 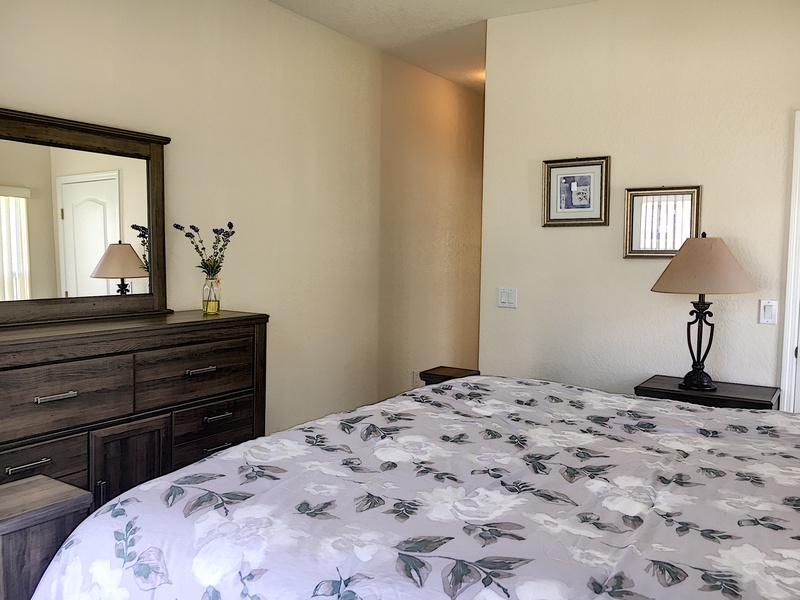 Updated with new flatscreens, new mattresses, new flooring! With Walt Disney World only 7 miles away, you will be on the doorstep for a most memorable holiday. Sea World, Universal Studios and Discovery Cove are only a short drive east on the I-4. 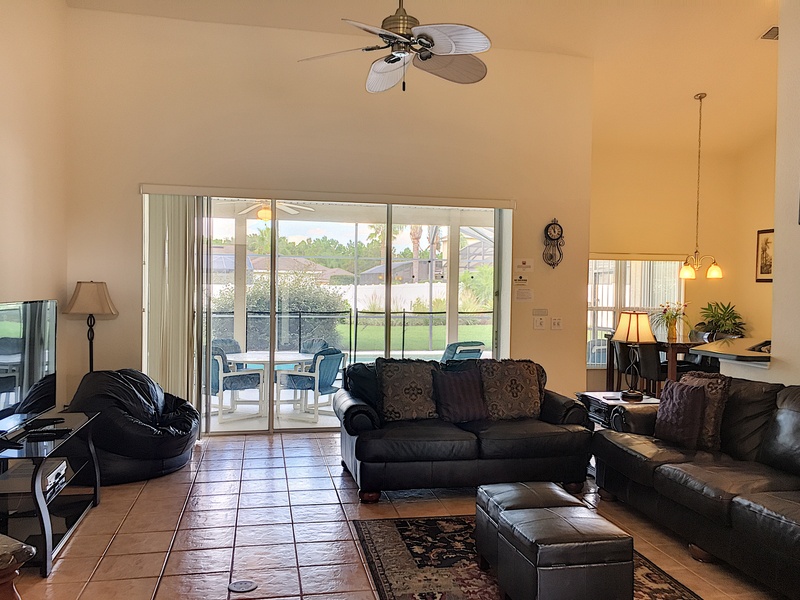 With the Atlantic and Gulf coasts to visit, the 60-70 minute drive is well worth seeing Kennedy Space Centre or St. Pete's Beach.This ideally located property is on one of the highest points in the area, and on a clear day you can see Disney from the on-site tennis courts. 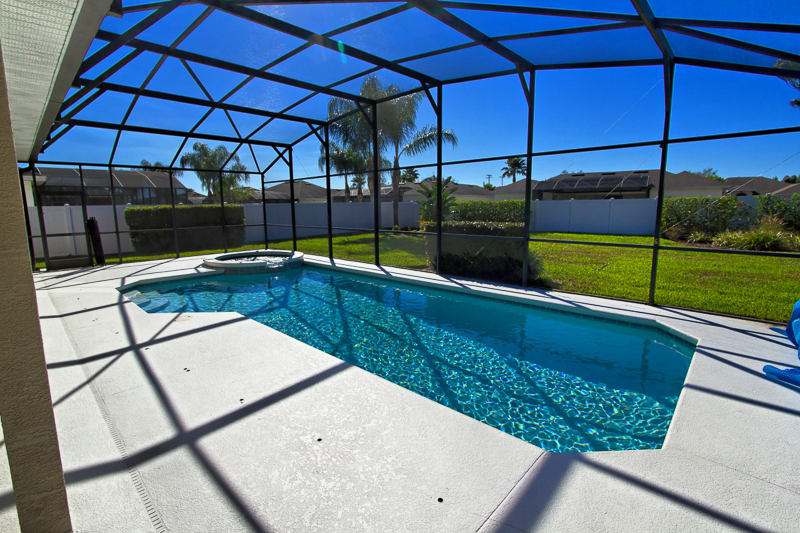 The property includes a 30x15 ft swimming pool, 7 ft spa and covered lanai area. 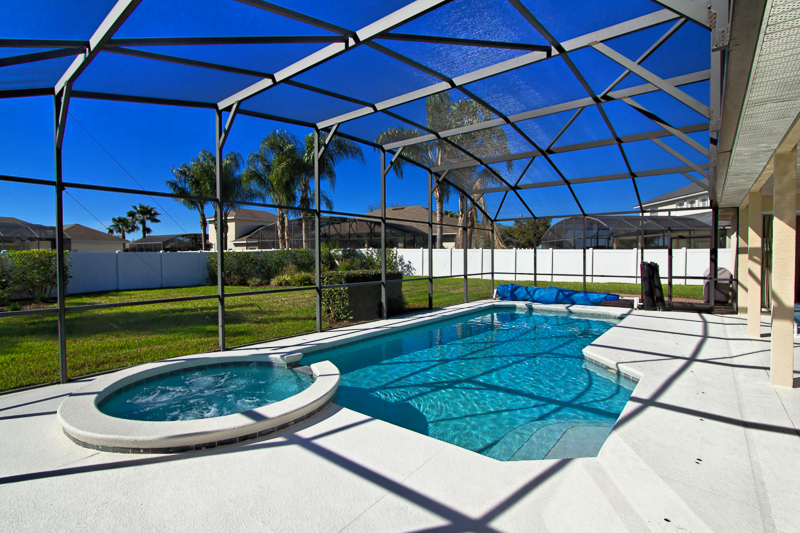 The pool, spa and decking area are screen-enclosed. 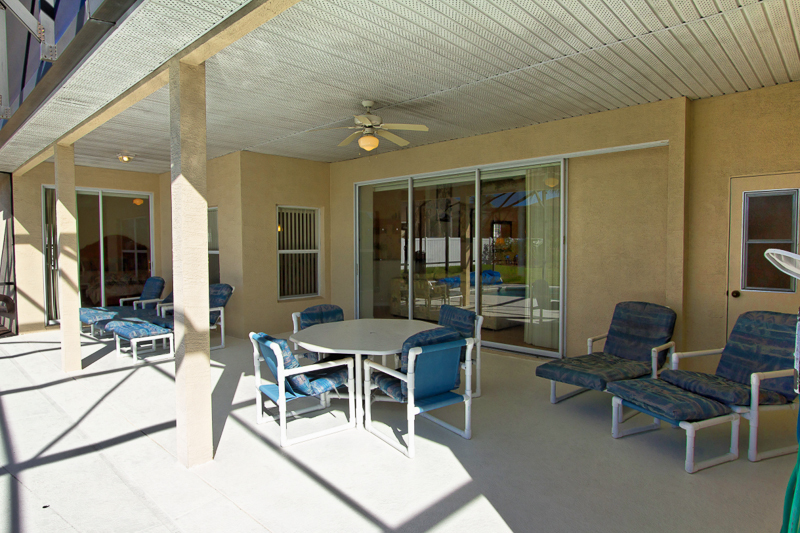 The lanai offers shade from the strong midday sun with pool loungers, recliners and foot stools, chairs and a table – ideal for al fresco dining. The pool is not overlooked from the back or right side as there is a fence and there are bushes on the left side. 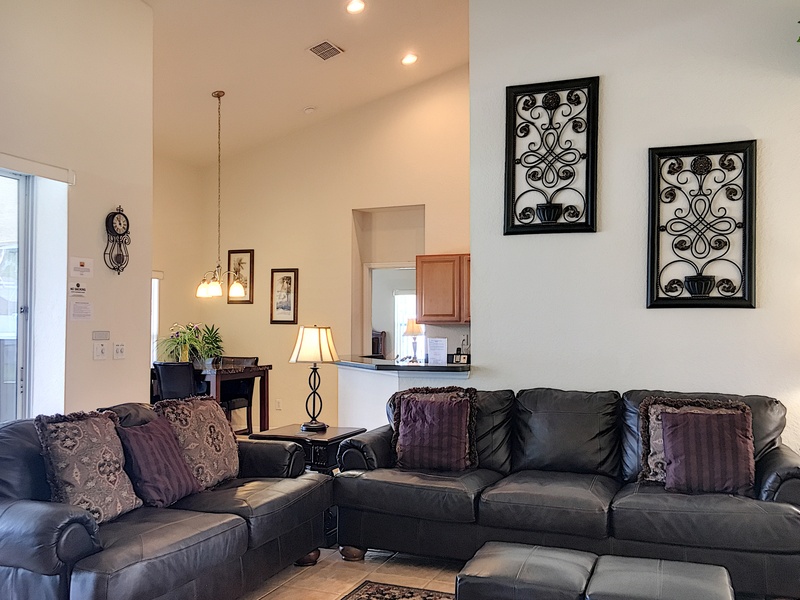 The home has air conditioning throughout and ceiling fans in the lounge and all bedrooms. 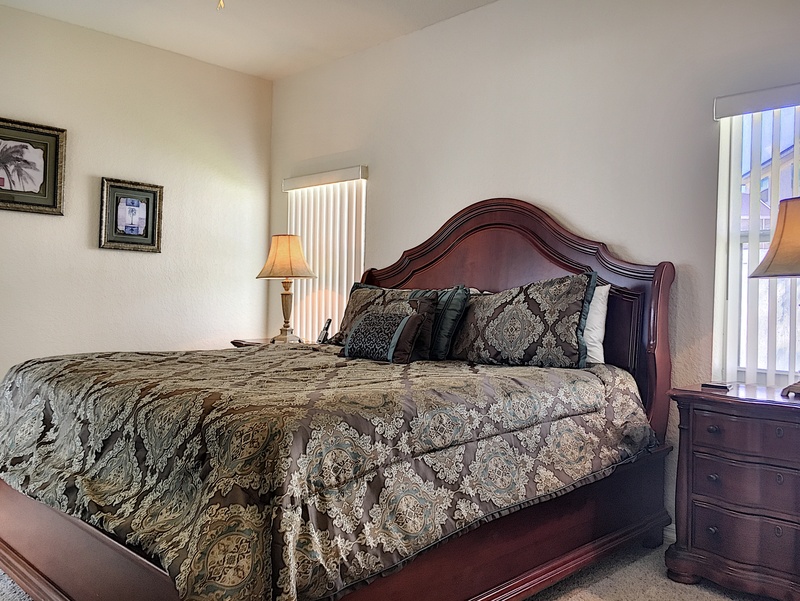 The first master suite has a king size bed, walk-in wardrobe, TV, digital alarm/clock/radio and telephone. 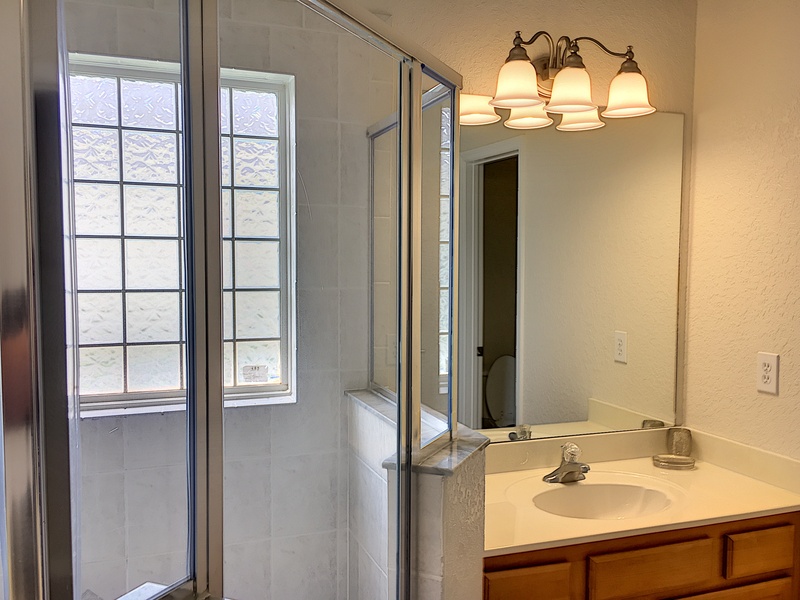 Adjoined is an en-suite bathroom with twin vanity basins, walk-in shower, and roman tub. 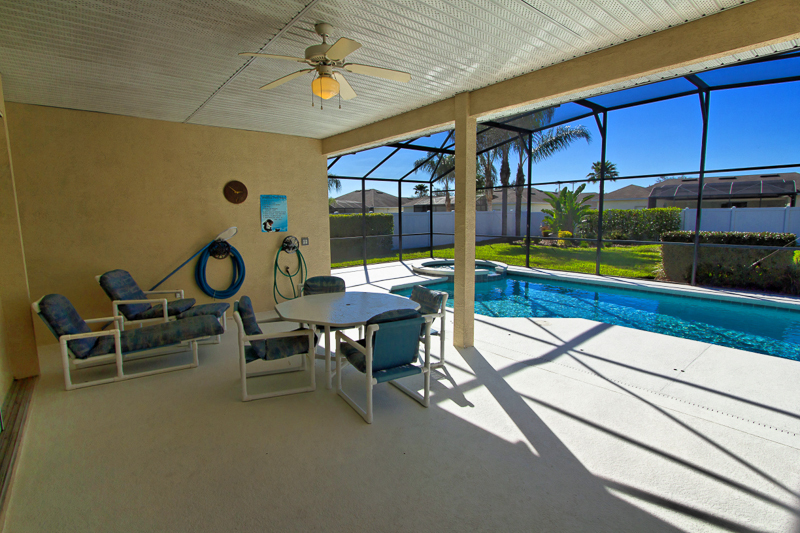 Patio doors lead out onto the pool patio. 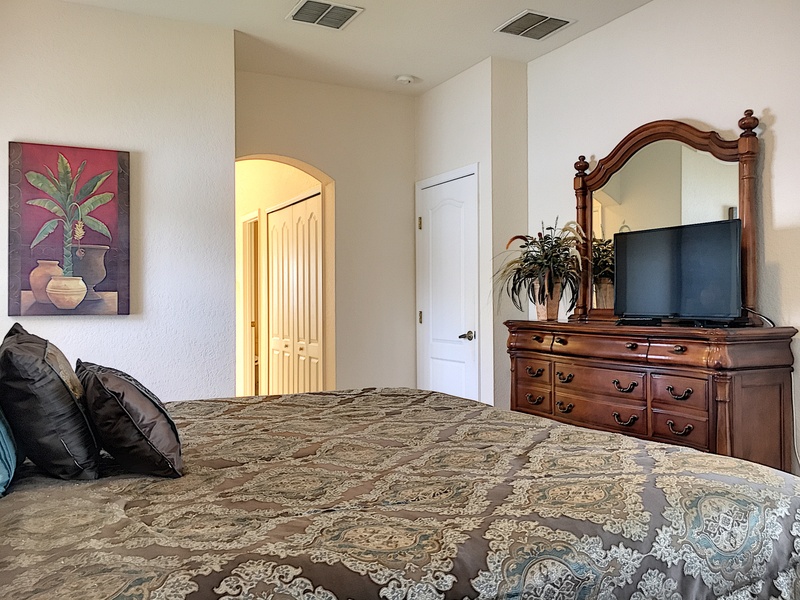 The second master suite has a queen size bed, walk-in wardrobe, TV and digital alarm/clock/radio, patio doors lead directly onto the pool deck. Adjoined is an en-suite bathroom with twin vanity units, and walk-in shower. 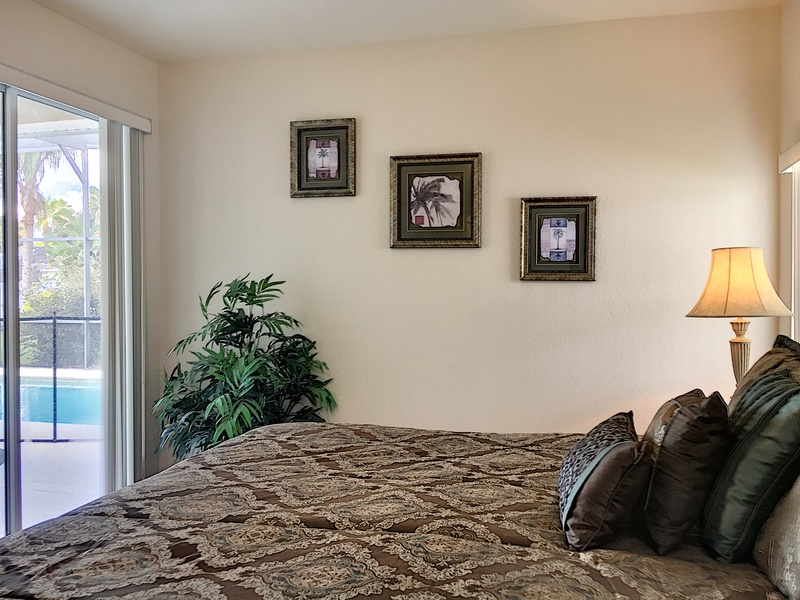 The twin bedrooms have TVs and share a third bathroom, which also leads directly onto the pool area to allow access to the bathroom. The tiled lounge area is equipped with a 32“ television with cable, a DVD player, PS2 and music system. 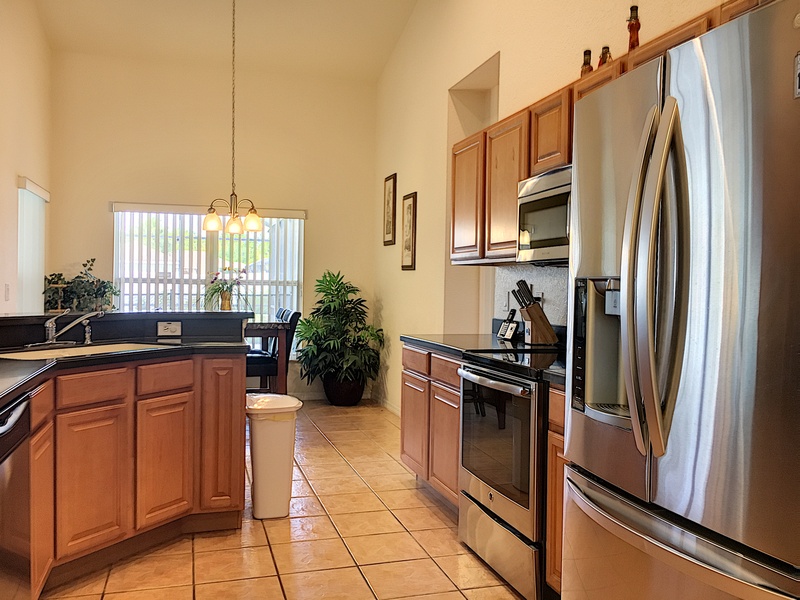 The kitchen is fully equipped including all appliances. Dishwasher, fridge/freezer with ice maker and cold water dispenser, oven with ceramic hob, microwave, coffee maker, toaster, blender and steamer. There is a utility area with washing machine, tumble dryer, iron and ironing board. 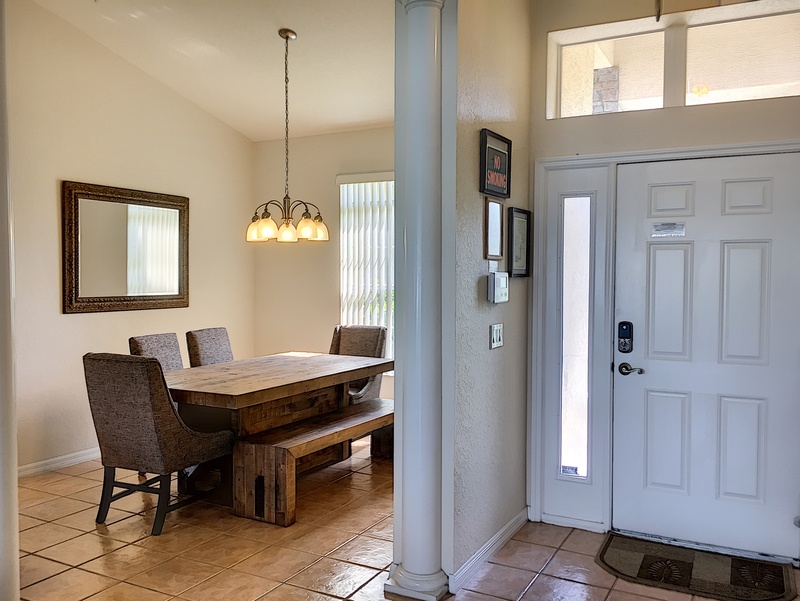 There is a breakfast nook area with table and four chairs. 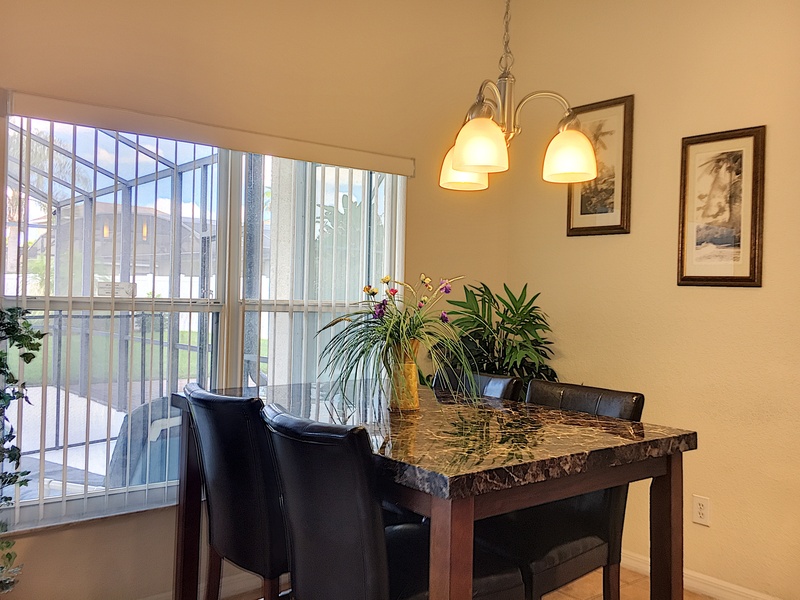 There is a formal dining area with seating for 8. 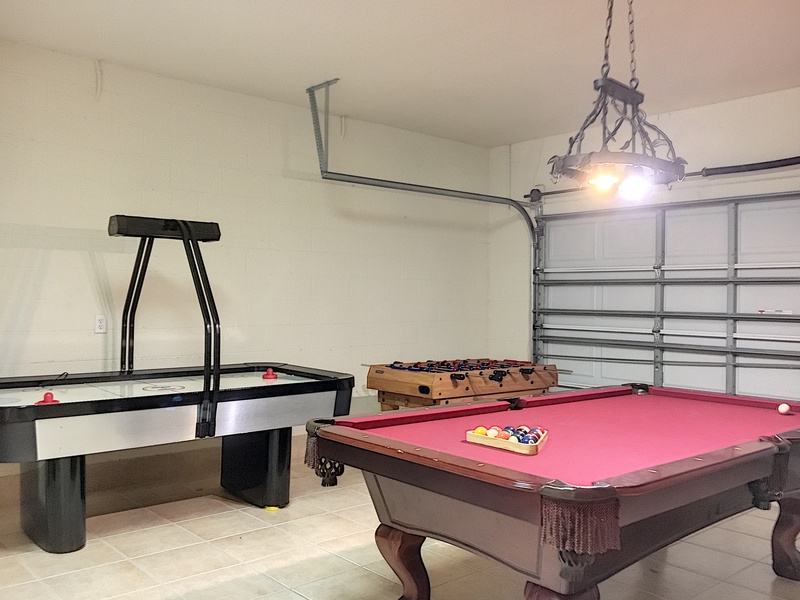 The garage has been converted to a family games room with 8ft pool table, 7ft air-hockey table, foosball and ice hockey table game. My family enjoyed the heated spa and pool and will come back again for a vacation. The app was very helpful in making the transition from Ga to the house go smoothly. 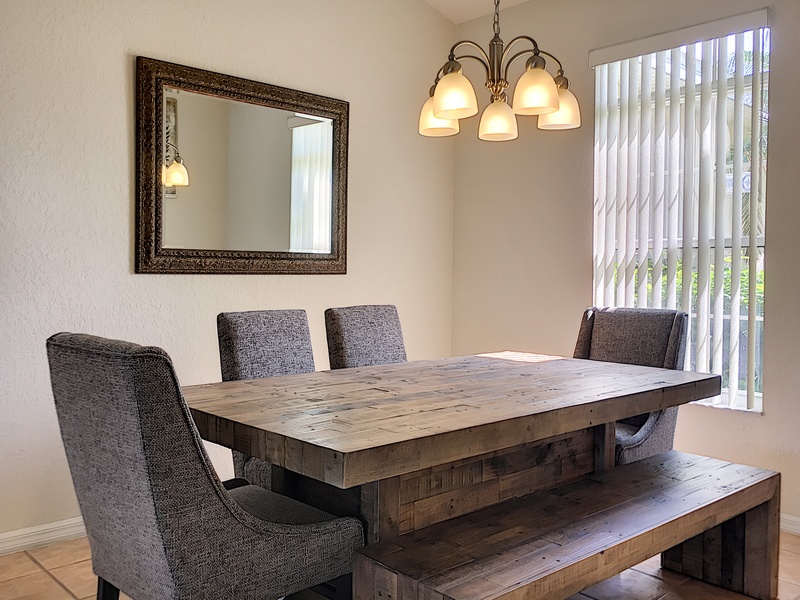 "I want to thank Florida Spirit Vacation Homes for the wonderful service you provided and for helping with the planning process.When renting a vacation home you are always unsure about what you will be getting until you arrive and we were very happy from the moment we unlocked the door. 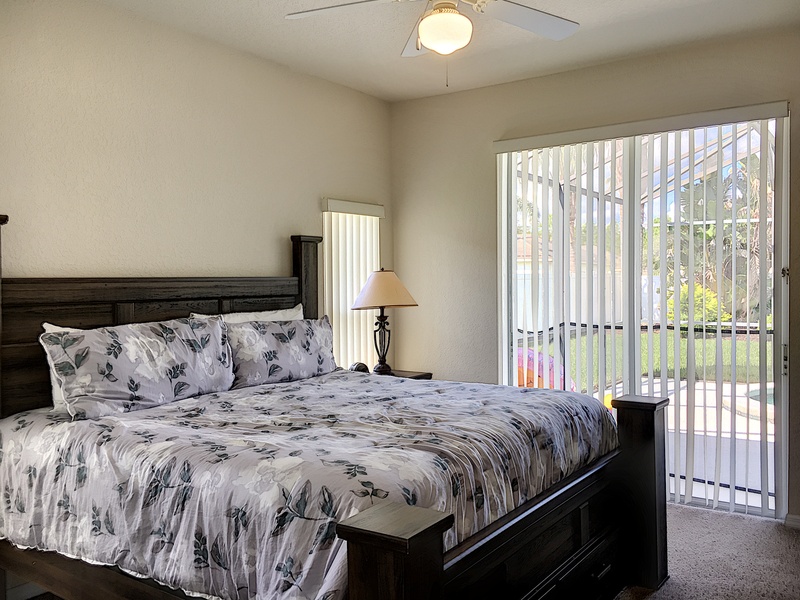 For this reason we have rented from you two years in a row and we have and will continue to recommend your company to everyone planning a Disney vacation. We hope to be back in the future. 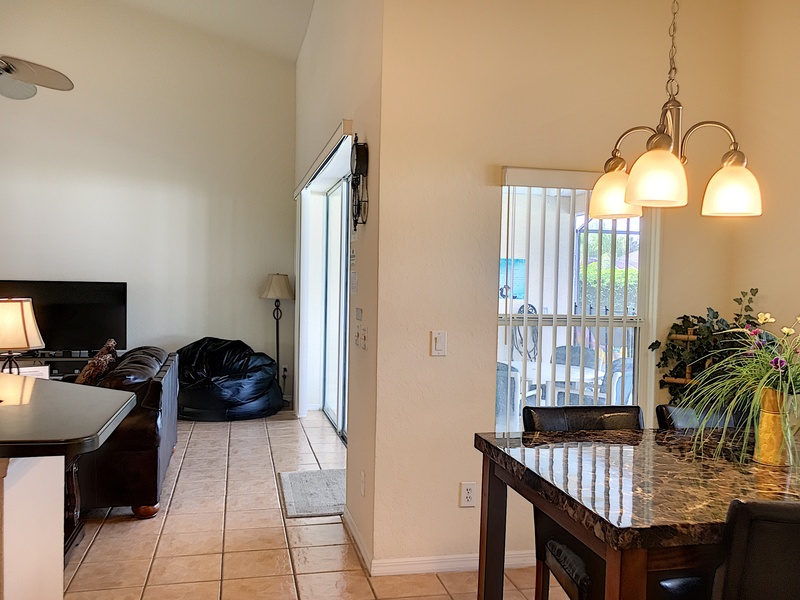 The home that we stayed in was exceptionally clean!Close enough to the action without being right in the middle, this is perfect when you want the time away to relax! 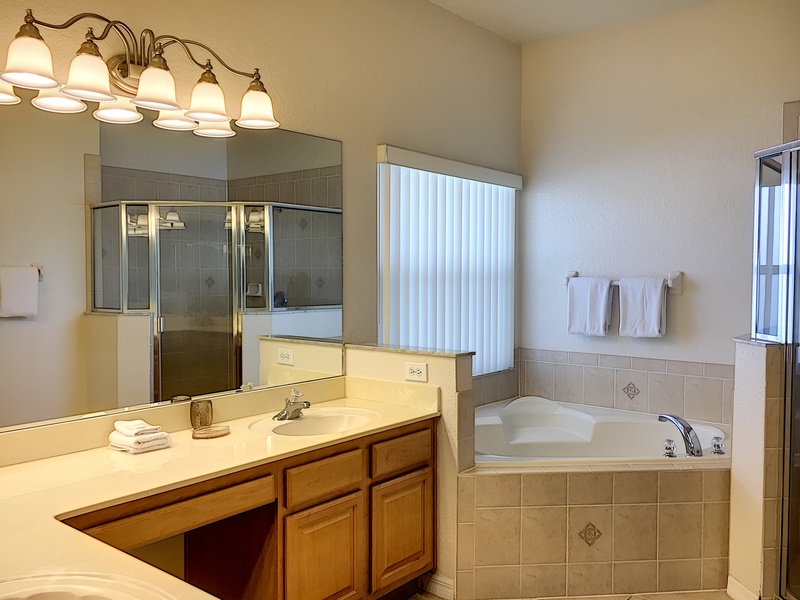 The home was in excellent condition, couldn't ask for better!" "LOVE THIS PLACE!! I came last year to the same house. This year we brought my in-laws. We had such an awesome time. The house is always so clean and convenient. I will never stay any place else. We are in the process to book it for next February. 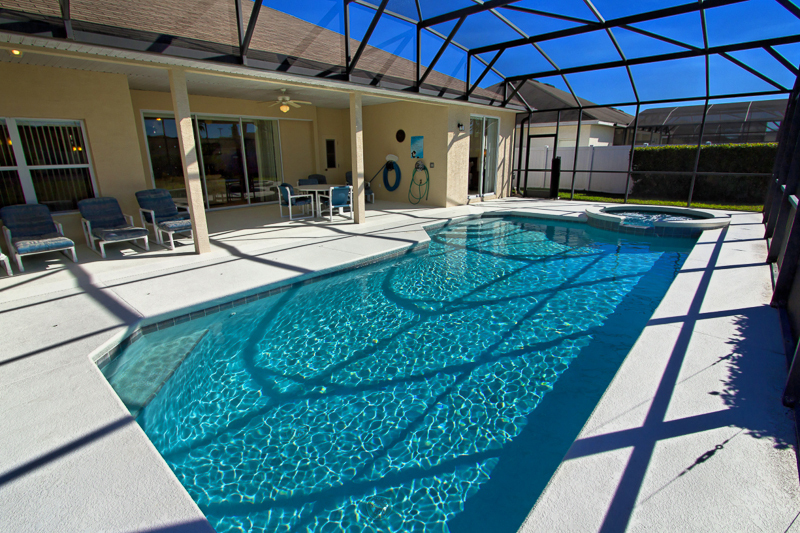 Love Florida Spirit Vacation Homes! I recommend it to everyone I talk to that is coming to the Florida area. Thank you again for another great vacation and my amazing memories!" 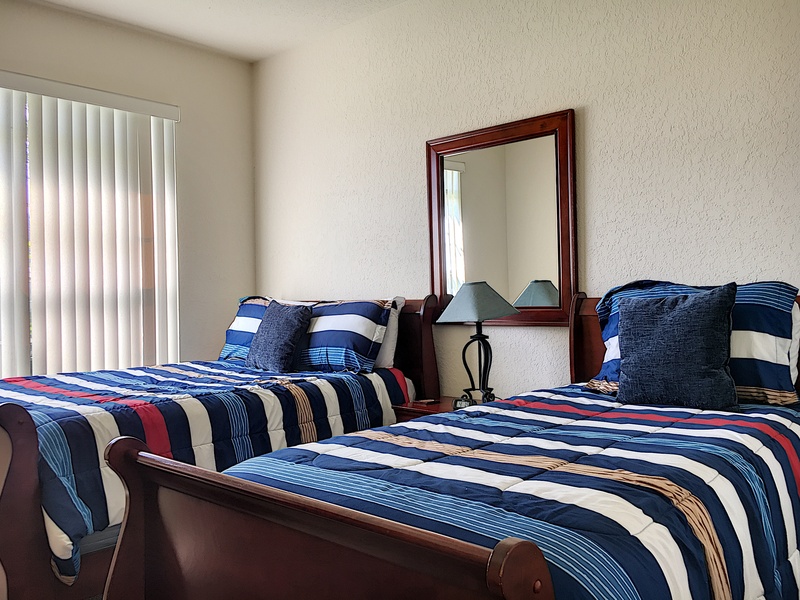 "We we decided to book a trip to Disney, we were reluctant to stay in a hotel, as we have two small children and didn't want to be confined to the hotel room once the kids went to bed. While searching on the internet, we found Florida Sprit and fell in LOVE. 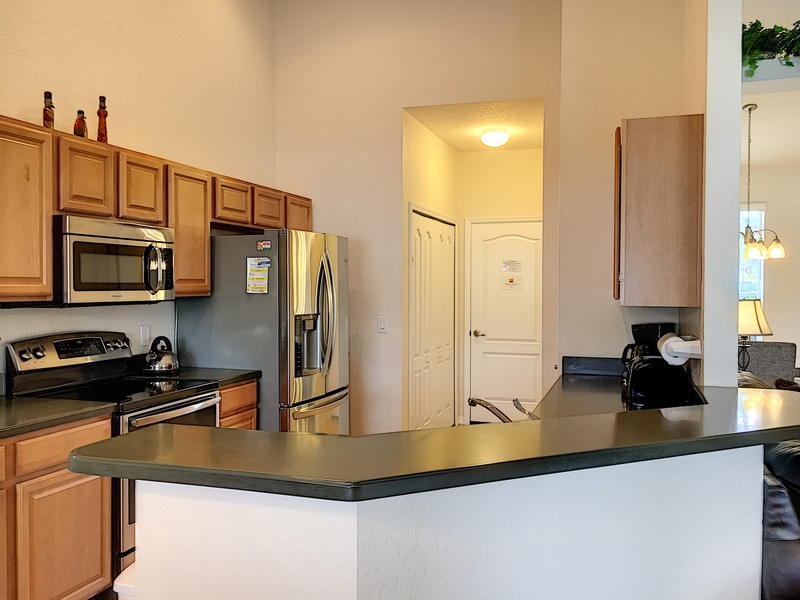 These homes are fantastic... fully equiped with everything we needed. It was a home away from home and the kids and we LOVED it. 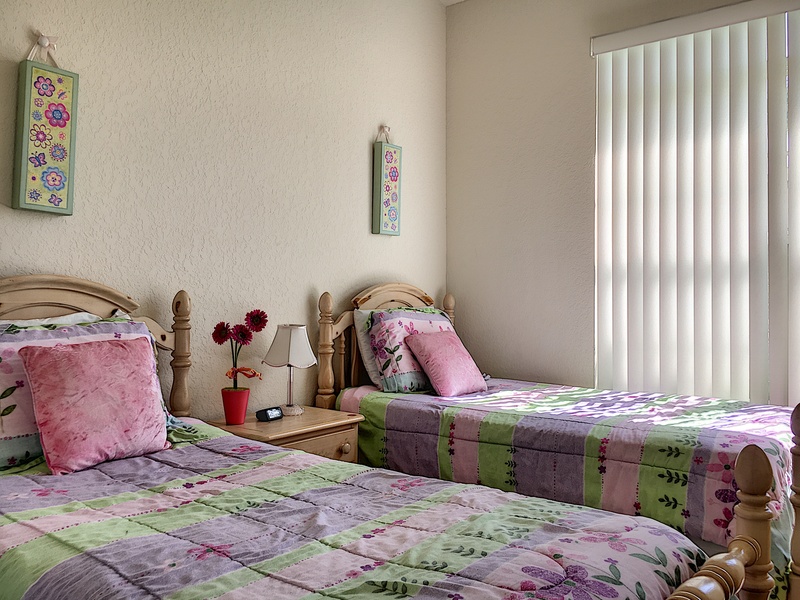 Both kids had their own room, the pool and spa kept us all busy, enough that we skipped the parks for one day to just relax at home!" BEST PLACE I EVER STAYED ON VACATION - This house that we stayed at was the best vacation we have had in a long time. The house was clean, close to everything and we loved having our own pool attached to the house. The house had all the luxuries of home and my family and I had a blast. Thank you Florida Spirit Homes for the memories that will last a life time! "What a beautiful spacious home. It was just minutes from Disney world where we took our children almost every day and a quick distance to return home if we just needed to chill out from the parks for a while. 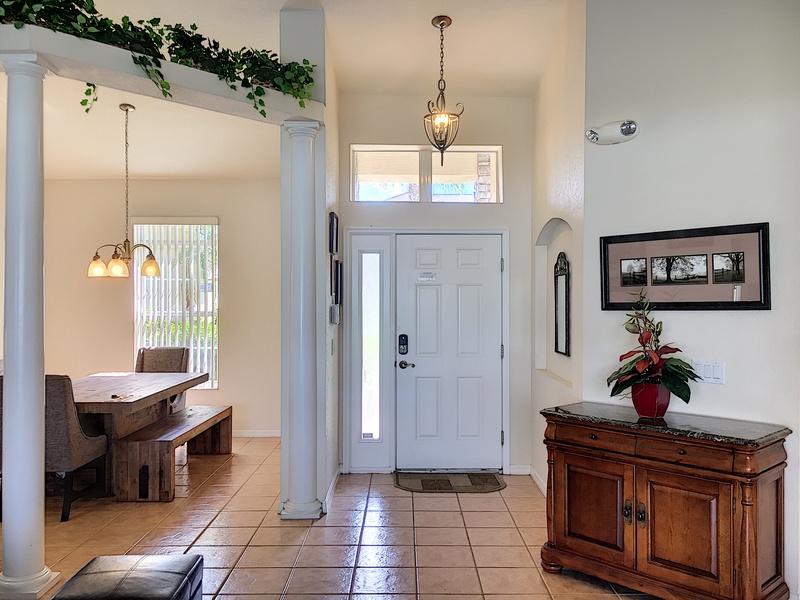 A very clean home, with beautiful tropical furnishings. A refreshing get away from the cold, snowy Wisconsin weather that we experience every winter. Excellent game room activities for kids of all ages to enjoy. Not to mention the beautiful heated pool that had a child security alarm for parents with small children. Bravo!!! Your a 5 star in my book!" "I wanted to let all of you know how much we enjoyed our home! 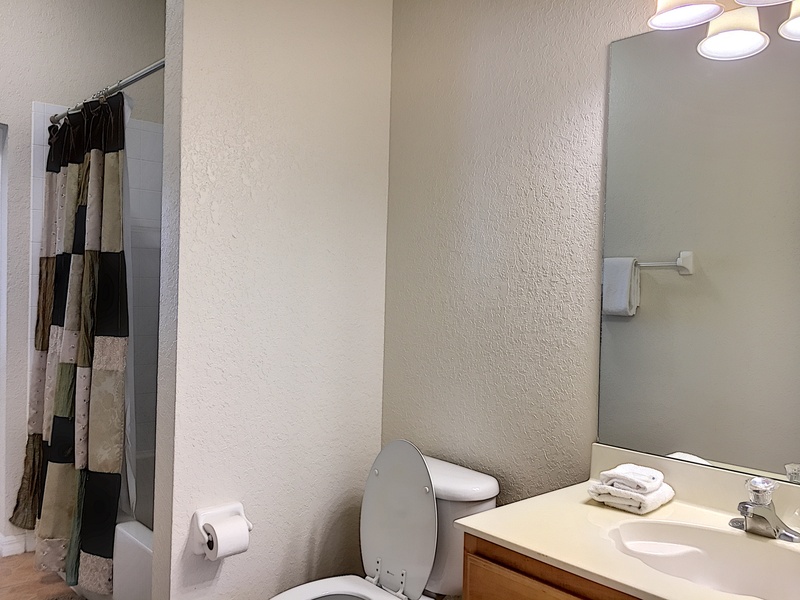 I was very hesitant about staying at another rental home. I rented one in the Outer Banks a few years ago, and was so disappointed. The pictures of the home I rented in North Carolina were taken years earlier, and when we arrived, the home was "worn, dirty and not at all what I thought I paid for." After reading a few of the comments from recent guests of Florida Spirit, I decided to give renting another try. 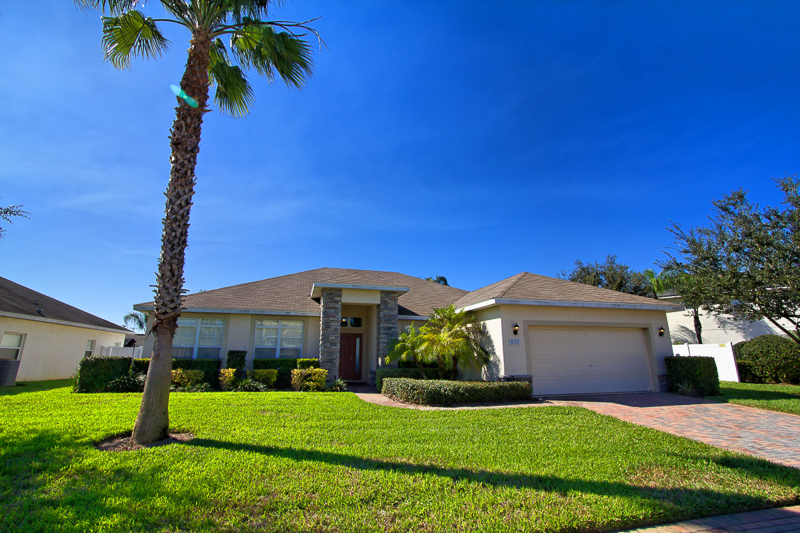 To my surprise the home we rented through Florida Spirit was even BETTER than the pictures! My kids LOVED the animal shaped towels on the bed! The neighborhood was quiet and in a gated community! We all felt save and secure!I have a family of 6 and wanted to do the Disney thing with my teenage kids. "After looking at the prices of staying on property, it just was not worth it. 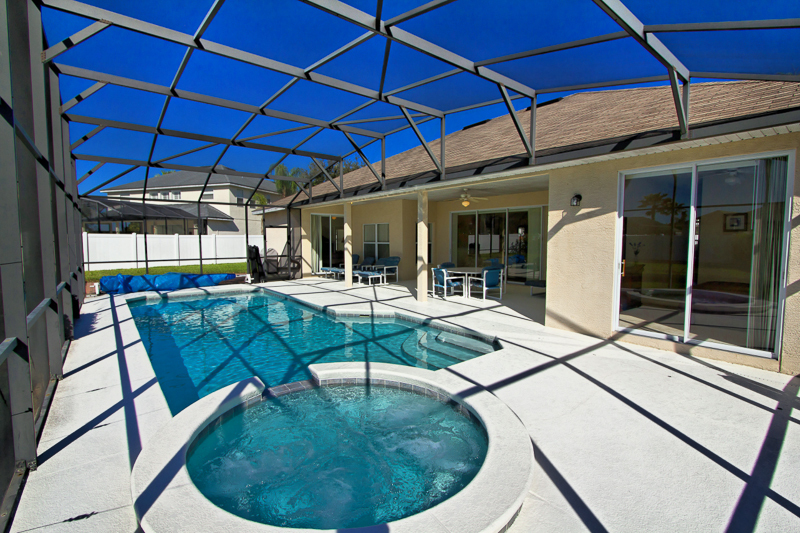 Who would stay on Disney property for more than the cost of renting a home with your own private pool and hot tub? It was great to eat breakfast at the house and pack a lunch for the parks. (We saved even more money packing our lunches!!) We were also close enough to leave the hustle and bustle and come back for dinner, and return in the evening (you only pay for parking once at Disney and you are free to come and go for the day!) My husband is also a person who needs his down time and coming home to the hot tub, pool, and his own TV was the perfect thing! It even rained one day and we came home, dried our clothes and returned to the park in the evening. Also, the staff at Florida Spirit was AWESOME! They told me places in the area to find groceries and reassured me that the home I rented was one of the best!!! (I was having nightmares prior to arrival!) Thanks again! I hope to come back soon!!"